This book is one in a series that provides every article that was published in Flatpicking Guitar Magazine by a particular columnist. This volume of the series presents all of the articles, and accompanying audio, written and recorded by Kathy Barwick. Kathy Barwick joined Flatpicking Guitar Magazine as a regular columnist during our ninth year of publication and she stayed with us until the end. During that time she become one of the favorite columnists among our readers. Her years of teaching private lessons and teaching at various workshops and camps helped her to produce columns that were through, clearly understandable, and relevant to the topics that are of interest to most flatpicking guitar players. While Kathy covered a variety of topics in her columns, a good number of her articles focused on crosspicking. Kathy’s background as a talented banjo and Dobro player and teacher helped her provide guitar players with a unique perspective on the art of playing crosspicking rolls on the guitar. 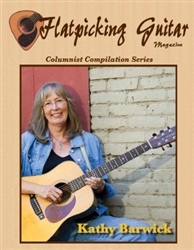 Although Kathy likes to point to her articles on crosspicking as being the focus of her column, the fact is that if you look through the long list of articles submitted by Kathy over the years, she actually provided valuable information and tasteful song arrangements that provide a very wide variety of flatpicking skills and techniques. Her talents extend way beyond her ability to crosspick! It was an honor to have her as a regular contributor to Flatpicking Guitar Magazine for nearly 11 years. This book presents 186 pages of information and includes 124 audio tracks on 3 CDs.